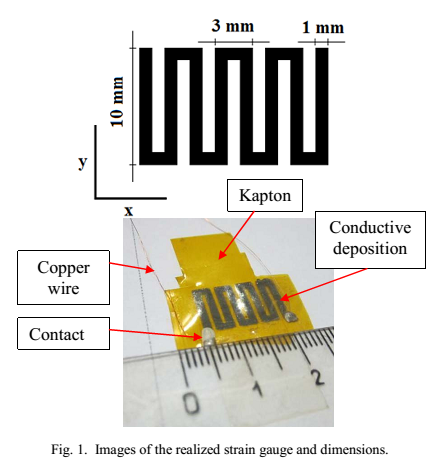 A resistive sensor for strain measurements that uses inkjet technology for biomedical applications has been studied, designed, manufactured and tested. Preliminary experimental results of a single sensor are shown and commented. The inkjet printing process is based on the emission through a nozzle of a material in liquid phase in fixed quantity, usually called ink, in the form of microscopic droplets contained in a cartridge. The emitted drop falls on a substrate, forming a pattern. The liquid solidification can occur through the solvent evaporation, chemical modifications or crystallization. Often a post-processing is required, such as thermal annealing or sintering. For the realization of the resistive sensor, a nanocrystalline silver ink was chosen. 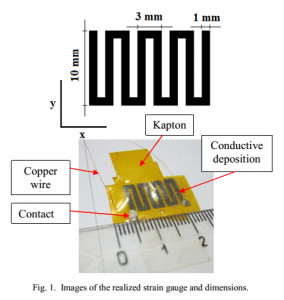 The substrate is Kapton and several studies demonstrate its biocompatibility as well. In this paper, a preliminary analysis of the material, its compatibility with the desired printer, the design considerations and finally the experimental results with the calculation of the Gauge Factor are shown. The research purpose is to study sensors, thin, flexible, inexpensive, and biocompatible for applications within the human body. © 2014 IEEE.